Please visit the new homepage of SLAMPP, http://slampp.abangadek.com/info/∞, and grab your latest copy over there. This Wiki will remain here as archive and for future references. Welcome to SLAMPP Live CD! SLAMPP is a generic Linux distribution that can boot directly from a CD-ROM, or optionally can be installed on a local hard drive. It is designed to be used as an "instant home server". 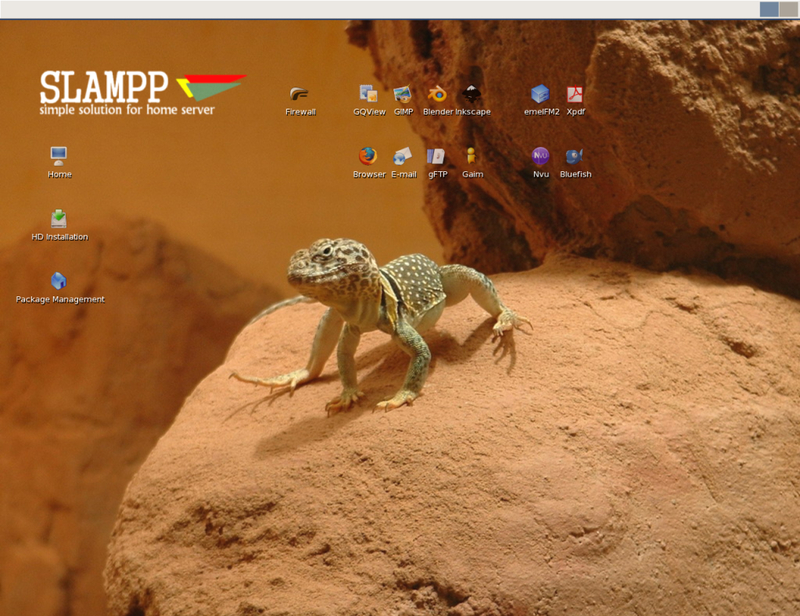 Similar to other Linux LiveCD distributions, SLAMPP gives a user new to Linux the chance to experiment with a non-Windows operating system, without the risk of changing or re-configuring the user's existing system. SLAMPP comes with preconfigured tools and applications that allow a personal computer to function as a server. Can you imagine how handy it is to have and carry a linux live CD that provides all things you need to setup such kind of server? Looking for a lite version of SLAMPP? Get more information about it over here, SlamppLite. 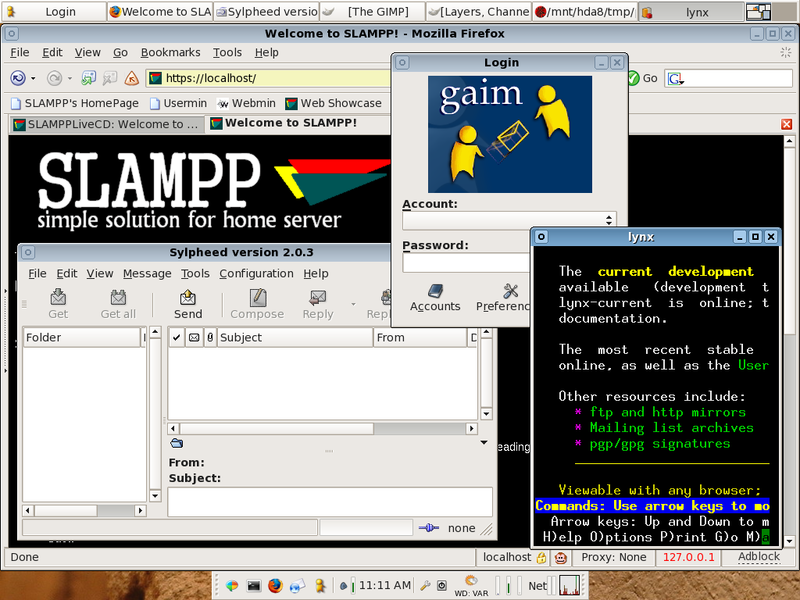 SLAMPP is built using SLAX∞ as its base, and Slackware linux∞ for packages. 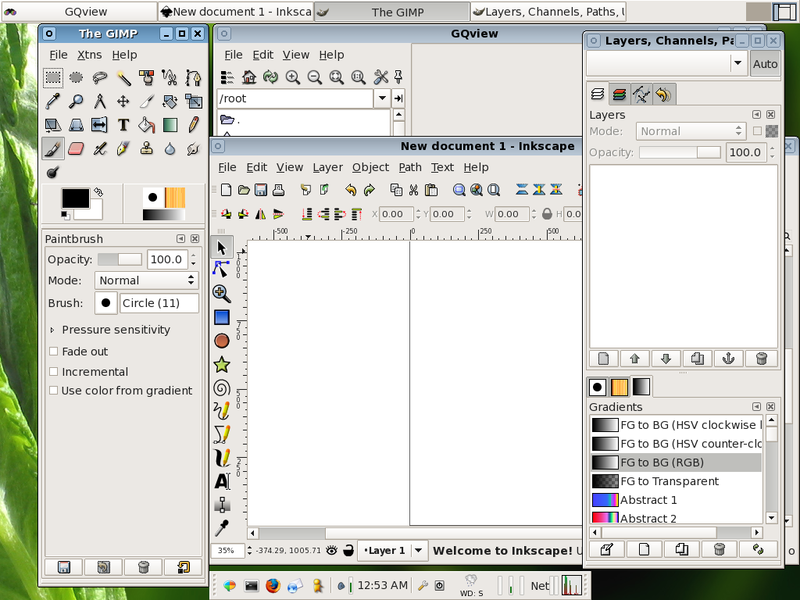 This means you are going to have two powerful distros in one, although SLAX is also based on Slackware linux. 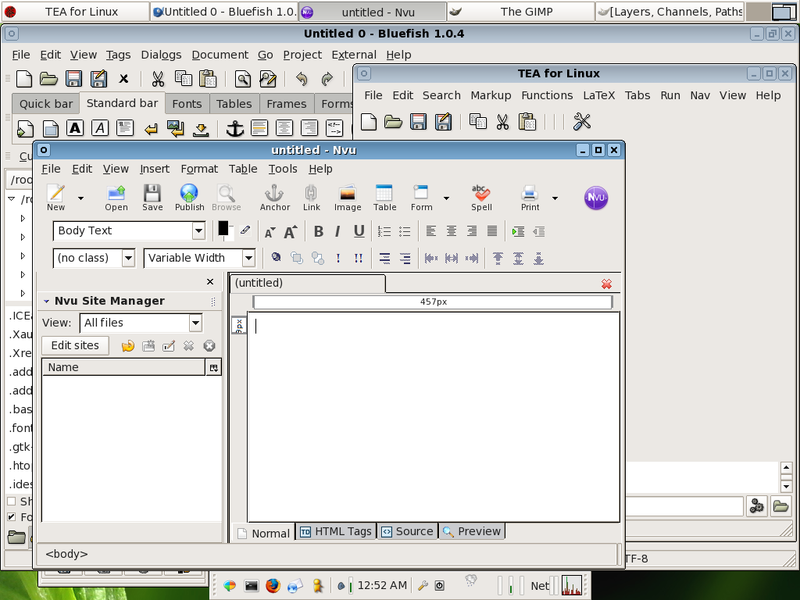 To compile everything into a working live CD, linux live scripts∞ are used. Modularity. The ability to add additional tools and applications easily in the form of modules. Each new module will be integrated seamlessly during the booting process. Aside from all the modules provided in the Live CD, custom modules can be created. The tools to do this can be found on the Live CD. Webmasters and web developers can use SLAMPP to show their work to others. To support this feature special scripts have been provided in the LiveCD. They only need to burn all files onto the CD and SLAMPP will take care of the rest. All setting and configuration changes made during use can be stored on the harddisk and restored for next session. Equipped with firewall, antivirus and content scanner. 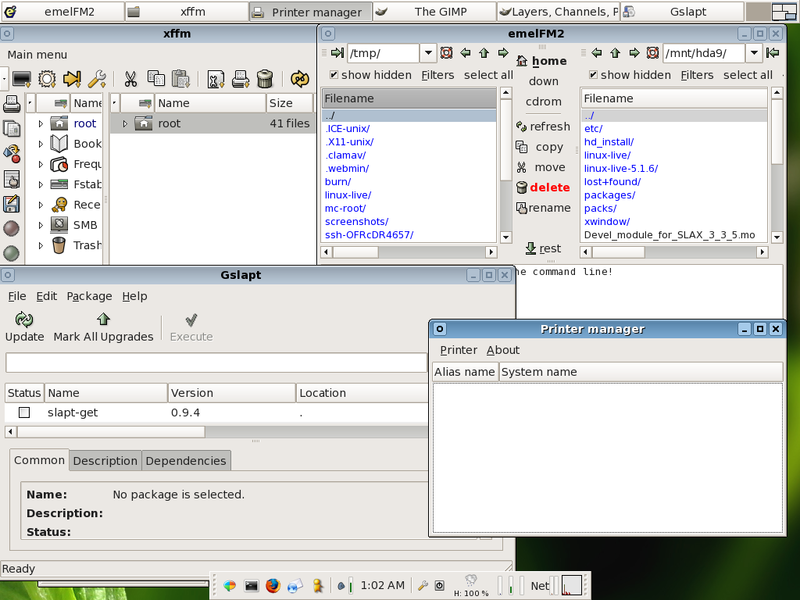 Uses slapt-get∞, Autopackage∞ and swaret∞ for package management tools and Xfce∞ as desktop environment. If you would like to be notified for any news on SLAMPP development, just subscribe to SLAMPP notification list∞. Please check out this blog∞ regularly. Latest version of this live CD is 1.1 (417 MB). - Jonas Groth∞ has no longer provide SLAMPP on his server. Thank you for your cooperation, Jonas and I am sorry to know that you are not able to provide the download anymore. - Jonas Groth∞ has generously provided a new mirror for SLAMPP on his server. Thank you. - The whole website is up again after having a major hardware failure of the server where I host SLAMPP in the last few weeks. Thanks Harry∞ for your kind assistance so far. - The development cycle is now resuming. Here is the full list of DownloadMirrors. Any help of distributing this live CD will be much appreciated. If you like to help me by providing SLAMPP through your server or somewhere else, please don't hesitate to contact me. All mirrors will be listed here. Thank you very much for using SLAMPP! 3. Order or get a CustomizedSolution based on SLAMPP. Harry Sufehmi∞ for web hosting. The Linux Mirror Project∞ for torrent download. Goodie Domain Service (GDS) of Vienna University of Technology, Austria∞ for download mirror. Jonas Groth∞ for download mirror. Online Insurance Quotes∞ for $50 donation. One Travel Source∞ for $50 donation. Apartment Finder∞ for $50 donation. Rubber Flooring & Rubber Floors∞ for $50 donation. Sell Structured Settlement∞ for $50 donation. Structured Settlements∞ for $50 donation. HTTP/HTTPS: Apache 1.3.34 with various mods, SSL will be provided as built-in feature. Package management: slapt-get/gslapt, pkgtool, autopackage, swaret. Please leave your feedback on this page, YourSuggestions, which tools or applications should be added or removed in the next release of SLAMPP. Thank you. SLAMPP is compiled by Kemas Yunus Antonius. Please send any suggestions, questions, critics and bugs regarding SLAMPP to kyantonius@kyantonius.com∞. Forum will be set up if there are enough demands for that. Until then, I think e-mail will be just fine. SLAMPP Distro Indonesia dari Belanda∞ (Indonesian) - Published on PC Magazine Indonesia∞ in January 2006. Slax - A small, complete and �€˜nice-looking�€™ Linux live distribution∞ - SLAMPP was mentioned in this article. Slampp-Lite 2.0 Server Review∞ - A nice review on gnuman.com∞. SLAMPPLite Live CD∞ - A review on Softpedia.com∞. SLAMPPLite Live CD v2.0∞ - A review on Phoronix∞. Freies Serverbetriebssystem: SLAMPP∞ - A review written on a German publication. Live-Server SLAMPP Lite 2.0: Westentaschenserver∞ - on the 03/2007 edition of LinuxUser Germany∞. 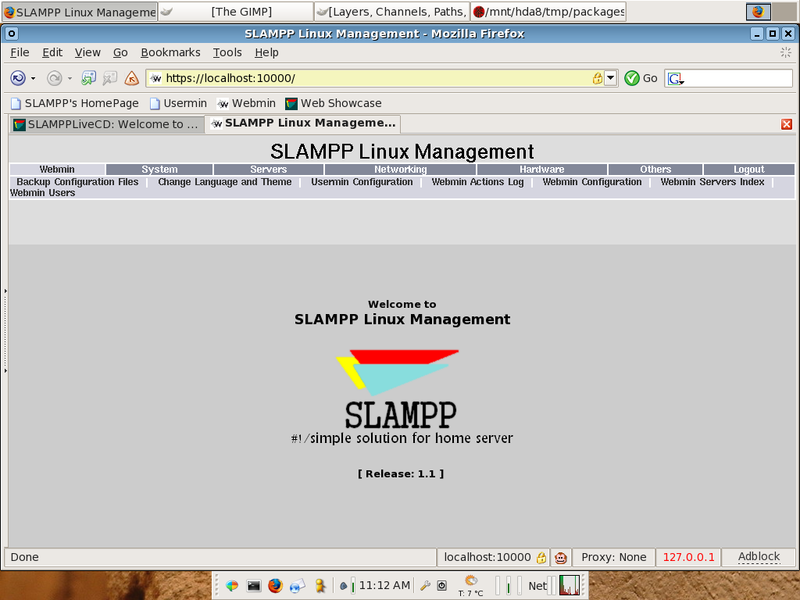 Last but not least, SLAMPP is also mentioned on many Linux forums. Thanks to everyone who already promoted SLAMPP on the internet or via other forms of communication. Any publications or reviews on SLAMPP are always welcome. Please let me know when you find or write such things. I really will appreciate it. Thank you.